Set on a beautiful 4 acres, prized as one of the "unique" spots at the quiet, tranquil south western shores of Lake Taupo. The views span across beautiful Lake Taupo around to the majestic Kaimanawa Ranges. Whakapapa Ski Fields and the Chateau just 45 minute drive from the front door! Fabulous family home comes with plenty of toys and kid friendly extras! One minute drive down to beautiful Pukawa Bay which has a boat access ramp. Coming for a wedding at Oreti Village? Our place is a 2 minute drive to Oreti and is an ideal place to use as your base for a wedding weekend. Only a couple more minutes down the road to Kuratau and Omori (which has a store selling all those necessary needs). Plenty of boat ramp access and wonderful protected, safe beaches. Fabulous walking/running tracks along the lakeside - all the way from Pukawa to Kuratau. 5 minutes down the road to the well-known Tokaanu hot pools. 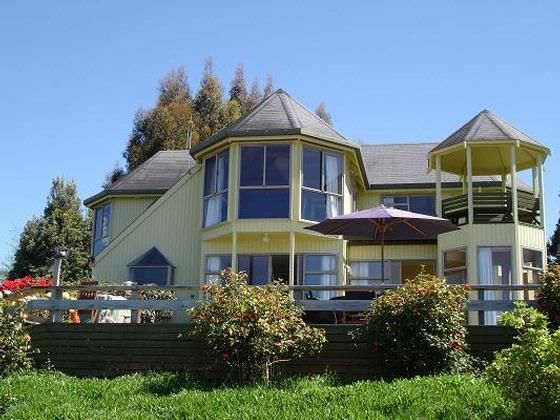 12kms from the town of Turangi which is the centre for all local adventures - Trout fishing on the famous Tongariro River, white water rafting, indoor climbing, fabulous access to Tongariro National Park and the outstanding Tongariro Crossing. Great access to lots of mountain biking options - the new Great Lake Trail, Tree Trunk Gorge, T42, and more. All within 30 min drive from the house. This place is the place to come for total privacy, tranquility, adventure and family fun - all year round! There is a mattress which can be used in any room. Cleaning charge is compulsory for more than 2 people staying. Beaches in the summer, snow in the winter, mountain bike trails nearby and trout fishing mecca! What an amazing property! The views from the house are fantastic- what a perfect location. Peaceful and beautiful location with some great views. House had pretty much everything we needed and was kept clean and tidy. A great spot to explore the surrounding areas. Would definitely come back. Thanks. Take your petanque, large grounds to enjoy. Quiet and secluded, with views over the lake. Water pressure wasn't great. Quick trip to boat launches. Great spot with beautiful views, comfortable house, older but clean and spacious. Great place with amazing views. Great place with amazing views. Well equipped. Great place for families with children.